Here at Lords, it truly is a gardener’s world. Our luscious lawns and flower-filled gardens are our pride and joy; especially in the summer when the butterflies and buds are out in full bloom. At this time of year our guests love to take afternoon tea al fresco with a refreshing tipple or two in the sunshine and who can blame them? The Cotswolds is without a doubt the most renowned destination in the UK for those with a thing for horticulture. The area is graced with dozens of nationally important gardens and pristine parks, each beautifully bespoke. Visitors have the choice of the flagship National Trust Hidcote Manor Garden, Batsford Arboretum, Kiftsgate Court, Bourton House Gardens and many others within a few miles of the hotel. Here at Lords of the Manor, there are two women on the ground responsible for making the magic happen, one being our talented Head Gardener, Sarah. She works tirelessly all year round to ensure that our own Cotswolds gardens are an attraction for guests. Who designed the gardens at Lords of the Manor? The garden is undergoing renewal and improvement under the directorship of renowned garden designer Julie Toll. 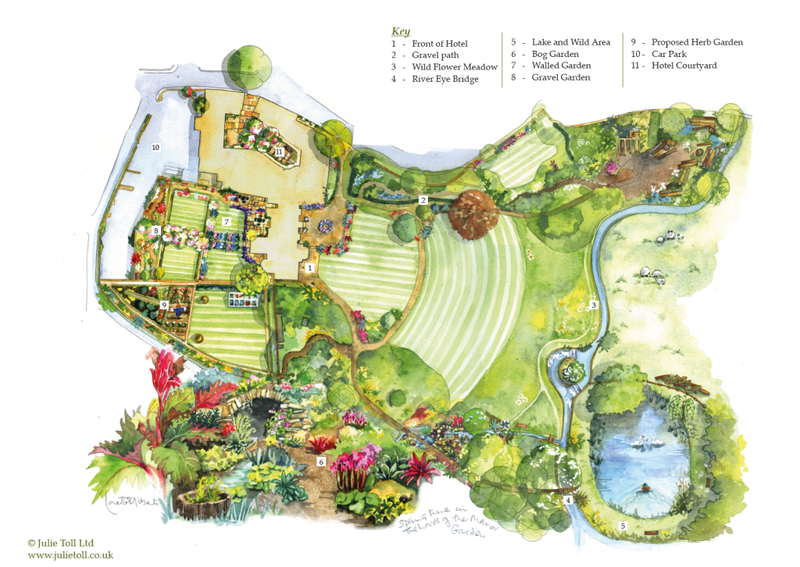 Julie Toll has been designing gardens in the UK and abroad since 1982, gaining international recognition by winning 7 gold and 2 silver medals at the prestigious Chelsea Flower Show. Julie’s work has been featured on television, radio and in magazines such as Gardens Illustrated, The English Garden and Homes and Gardens and she is a fellow of the Society of Garden Designers. Which is your favourite part of the garden at Lords of the Manor? My favourite part of the garden is probably the Bog Garden, which is full of unusual plants perfectly suited to the wet conditions created by natural springs. What are the seasonal highlights at Lords? The garden year starts with swathes of snowdrops and hellebores flowering in the front garden followed by various daffodils and tulips adding bright splashes of deep colour. In Spring, the fruit trees in the walled garden are full of blossom and bees while the euphorbias are striking in the gravel garden. In early summer the meadow really comes to life with natural orchids, meadow buttercups, daisies, yellow rattle and an increasing variety of wild flowers enticing in lots of butterflies and insects. Later in the summer, the lavender flowers fill the back garden with their heady scent, another magnet for the butterflies and bees. Early autumn is harvest time for the vintage apples and espaliered pears. Then in late Autumn, our large selection of trees change through their stunning autumn colours. The stalks and seedheads of the glorious summer are left standing in the flowerbeds through the winter months with the ornamental grasses highlighting the garden glowing golden in the sunshine or sparkling silver on frosty mornings. What’s the idea behind the wildflower area at Lords? The wildflower meadow links the garden to its surroundings, mirroring the natural flora all around us. It is an environment in which natural wildflowers can colonise and is a haven for butterflies and other insects. It changes every year. Are there any new developments coming up in the garden? Our latest project is an ornamental herb garden in the walled part of the garden. It has been landscaped and will be planted this autumn. Lords is surrounded by well-known gardens – do you have a favourite that’s open to the public? I couldn’t pick a favourite, but if you are thinking of seeing the National Trust Hidcote garden, be sure to make time to call in at nearby Kiftsgate Court which is less well-known but equally impressive. What’s your favourite part of gardening? Patience is rewarded in the garden. It is exciting to watch newly created areas of the garden improve year by year. What would be your top tips to those building their own garden? Make sure you understand where and when the sun reaches your garden and what the condition of your soil is. Choose plants appropriate for the environment you have to offer. For clues and ideas, look around and see what already grows happily in your vicinity. Here at Lords’ we regularly create offers which include trips away to see the Cotswolds’ most stunning natural gardens so make sure you keep an eye out here!